Miss Bindergarten Celebrates the 100th Day! The schools here recently celebrated their 100th Day. I don’t know if this is a universal school celebration or what, but I find it to be a fun day. The kids get all excited about it and spend the whole first half of the school year in high anticipation. It’s remarkable! We happened to visit a kindergarten class a couple of days before the BIG DAY and boy! were those kids and teachers revved up!! The big talk was all about what they were going to bring or wear in honor of the BIG DAY. 100 coins, 100 cookies, 100 cars, 100 ribbons in their hair. I have a couple of necklaces that I can choose from to wear if I happen to be at school on that 100th Day. A necklace with 100 jingle bells and one with 100 bookmarks. Suitable for anyone counting to 100!! There are several books about Miss Bindergarten in Kindergarten. She’s my kind of teacher!! Literally!! She’s a real Dog!! 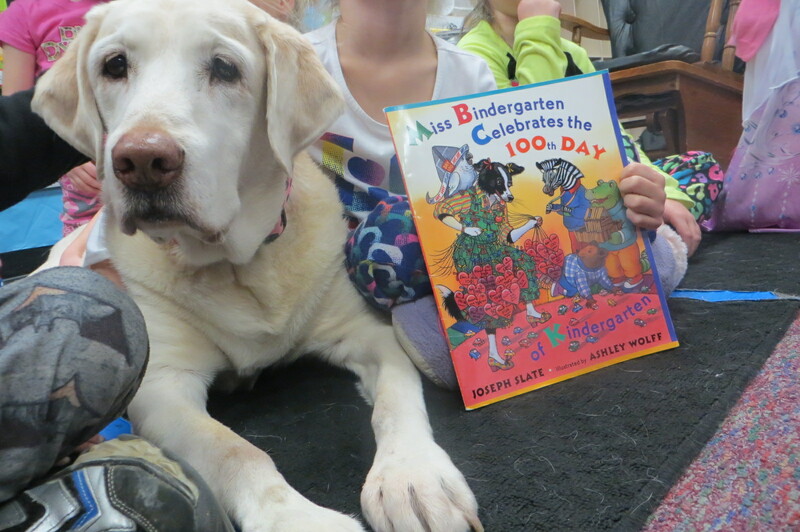 This is a fun one about Miss Bindergarten and her class getting ready for that 100th Day. It’s a counting book, a kind of how-to book of suggestions, and an alphabet book! Whew! So much going on!! We read it with the whole class, but I think it would be better read one on one. There is just too much going on in those illustrations!! You need to be able to spend more time on each page! So, it’s the night before Day 100 and all the kids are getting their 100 things ready. We get to meet each student ALPHABETICALLY!!! From Adam to Brenda to Christopher all the way to Xavier and Yolanda and Zachary! And while the kids are all getting ready, Miss Bindergarten is, too!!! Shopping and baking and crafting and decorating. Boy, is she one busy teacher!!!!! And boy! Are those kids going to have one FUN-HUNDRED Day!!!!! This book is chock full of ideas for teachers and students both! It is a resource in and of itself!! It should be in every classroom!! Reading this book and thinking of all the 100 things and doing all the counting made my head spin! I can count to 3 pretty good, but anything after that just puts me to sleep. I hope that wherever you are, you get to celebrate the number 100! And if you have already, I hope it was a good one!! This happens to be Friday – Perfect Picture Book Friday – as celebrated over at Ms Susanna Hill’s blog. You might want to visit her HERE and check out all the other books on today’s list! This is not my class – I don’t know these kids, but this could be my class!! This is what my day looked like!! Just check out that Rhythm!! 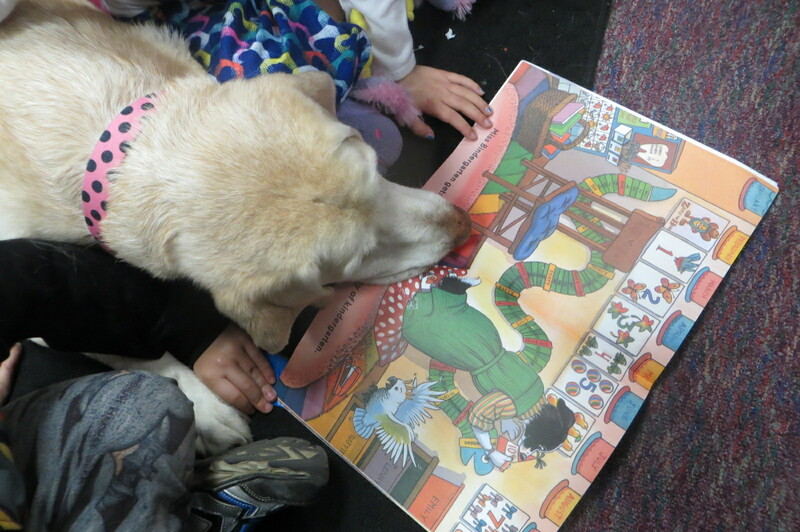 This entry was posted in alphabet books, children's books and tagged 100 Days, Ashley Wolff, counting, Joseph Slate, kindergarten, Miss Bindergarten, reading dogs by readingwithrhythm. Bookmark the permalink. Well, it looks like my bag is going to have 100 fine new books in it after my trip to the library this Sunday from the looks of things over at Susanna’s. This is another fine book for me to get. I Love the sound of it. Celebrating 100 days is a big deal at our school. This is the perfect book to get ready for it. That is a fun day! H wanted to cheat and take what she made last year, little monkey. What a great book with so many themes for teachers to work with — counting and the alphabet. Love the idea of this book. So much fun! Mom and I also love Miss Bindergarten. But counting baffles both of us. When Mom says the word, “How many times do I have to tell you…. ?” I never know the answer. Yes, like Pat I found this to be a really fun book. I also loved the counting song. How cute. Thanks heaps for sharing this. 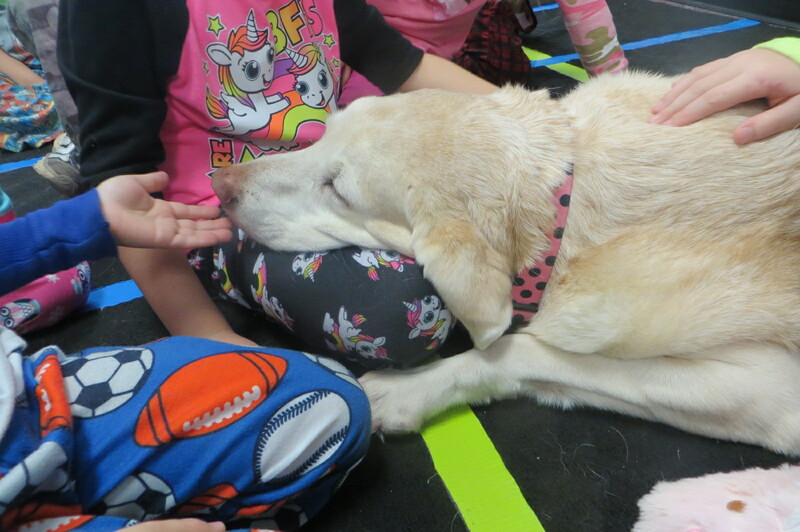 One hundred woofs for Miss Bindergarten! Fantastic PPBF Rhythm. 100 bookmarks? I would like to see this necklace! I would love to see (and hear) your 100 jingle bell necklace. My son celebrated 100 days last Friday and BOY… it was my first year in the school environment and BOY that was a huge event. Love the book suggestions. Thanks. I think it may be the biggest event of the year!!! And what did your boy take for his 100? Great choice. I’d forgotton about 100th day. Does that mean my “baby” is growing up? Sniff. I don’t know how you could forget such an important day!!!! Whew! you’re making me hungry with all those 100 things!!! I’ve never heard of this before but it sounds really good, both the book and the actual day, I would bring 100 books and then be grumpy with tired arms for the rest of the day. Oh Rhythm, I LOVE your face!! !